Bill Baker, key grip with the CBS television series NCIS, Mike Gill, vice president Americas with Medtronic Diabetes, George E. Smull, financial advisor with Waddell & Reed, and Fernando Villa, partner at Allen Matkins will be honored at annual Father of the Year event on June 17, 2016 in Beverly Hills. Honorees will be honored for their efforts in demonstrating the ability to balance their personal lives, serve as a role model for their children, and help make a positive difference in the diabetes community. 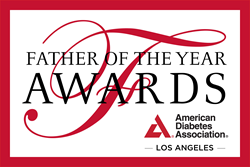 The American Diabetes Association Los Angeles, in partnership with the Los Angeles Father’s Day Council, has announced their 2016 honorees for the 17th Annual ‘Father of the Year’ awards dinner on Friday, June 17, 2016 at the Beverly Hilton Hotel in Beverly Hills, California. Doors open at 6:00pm for cocktail reception and dinner and event program starting at 7:00 p.m. Event proceeds go towards funding diabetes research to prevent, cure and manage diabetes. The 2016 Honorees include: Bill Baker, key grip with the CBS television series NCIS, Mike Gill, vice president Americas with Medtronic Diabetes, George E. Smull, financial advisor with Waddell & Reed, and Fernando Villa, partner at Allen Matkins. Honorees will be honored for their efforts in demonstrating the ability to balance their personal lives, serve as a role model for their children, and help make a positive difference in the diabetes community. The event is co-chaired by Denise Jonas and Kevin Kaiserman, M.D. Chris Schauble, co-anchor KTLA Channel 5, will serve as Master of Ceremonies for the event and throughout the evening the musical group The Summit, a big band sound infused with jazz influence creating a new style of pop music will perform. The Los Angeles Father’s Day Council will also present the Howard Rosenberg Award in recognition of its namesake. This award recognizes an alumni father, family or volunteer who continues Rosenberg’s legacy by mirroring his passion for raising funds to support the important work of the Association. Prior to his passing in 2013, Rosenberg was a prominent executive in the men’s apparel industry, philanthropist and founder of the regional Father of the Year event in Los Angeles in the early 1980s later expanding the event across the country. Presenting sponsor Medtronic is the global leader in medical technology. The Diabetes Group at Medtronic (http://www.medtronicdiabetes.com) works together with the global community to change the way people manage diabetes, according to a company statement. The company aims to transform diabetes care by expanding access, integrating care, and improving outcomes, so people living with diabetes can enjoy greater freedom and better health. Additional event sponsors include Waddell & Reed, Dr. Kevin Kaiserman and Michelle Notkin, and Bella Los Angeles Magazine. The American Diabetes Association is leading the fight to Stop Diabetes and its deadly consequences and fighting for those affected by diabetes. The Association funds research to prevent, cure and manage diabetes; delivers services to hundreds of communities; provides objective and credible information; and gives voice to those denied their rights because of diabetes. Founded in 1940, our mission is to prevent and cure diabetes and to improve the lives of all people affected by diabetes. For more information please call the American Diabetes Association at 1-800-DIABETES (1-800-342-2383) or visit http://www.diabetes.org Information from both these sources is available in English and Spanish.